A son of David's sister Zeruiah. Abishai ranked as a general in command second only to his brother Joab (II Sam. x. 10, 14, xviii. 2, 5, 12). By saving David's life (II Sam. xxi. 17) and by the slaughter of three hundred warriors (II Sam. xxiii. 18), he secured a prominent place among the king's bodyguard. He was as relentless and cruel toward his foes as he was loyal to his family and king. David's moderation alone restrained him from slaying Saul as he lay asleep in his camp (I Sam. xxvi. 7-9). With Joab, Abishai treacherously murdered Abner in revenge for the death of their brother Asahel (II Sam. iii. 27, 30). He was a good example of those soldiers of fortune whose courage and blind devotion made David master of the Canaanitish kingdom. In the margin of I Chron. ii. 16 he is called "Abshai." David, on a hunting expedition, is enticed over the Philistine frontier by Satan in the form of a stag; he is then seized by Ishbi, the brother of Goliath, who intends to put him to death. David's distress, however, is revealed in a miraculous manner to Abishai—according to some, by the sudden turning of the water in which he is bathing to a blood-red color; according to others, through a sign given by a dove, the symbol of Israel (Ps. lxviii. 14). Abishai immediately sets off toward David, when, by another miracle, he is brought thither in the space of a moment (the Haggadah uses the phrase "ḳefiẓat derek"—jumping of the road—in this instance as well as in the wondrous journeys of several other pious men). On his arrival Abishai first encounters Orpah, the giant's mother, and, when he becomes aware of her evil intent toward him, slays her. Ishbi, on catching sight of Abishai, forces his spear into the ground, point upward, and seizing David in his hands, raises him on high in order to dash him upon the point. Thereupon Abishai utters the ineffable name of God, and therewith arrests David's descent midway. Both David and Abishai then pray to God for help; and as the latter again pronounces God's name, David falls to the ground unhurt. Both are immediately attacked by the enraged giant, who would soon have overcome them, but for the shock he experiences when Abishai informs him of his mother's death. This paralyzes him to such an extent that David and Abishai find no difficulty in slaying him (Sanh. 95a; compare also Jellinek, "B. H." iv. 140-141). As with all other Biblical heroes, the Haggadah is inclined to see in Abishai also a man of spiritual prominence. The phrase used in II Sam. xxiv. 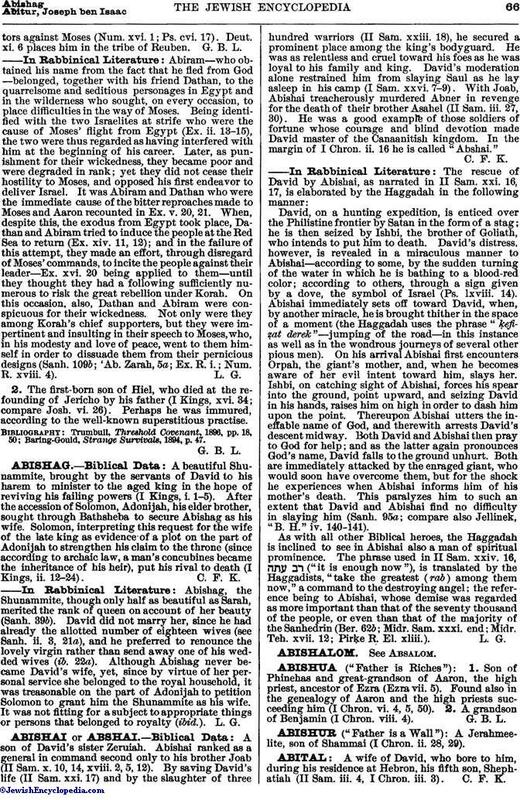 16, ("it is enough now"), is translated by the Haggadists, "take the greatest (rab) among them now," a command to the destroying angel; the reference being to Abishai, whose demise was regarded as more important than that of the seventy thousand of the people, or even than that of the majority of the Sanhedrin (Ber. 62b; Midr. Sam. xxxi. end; Midr. Teh. xvii. 12; Pirḳe R. El. xliii. ).